Debbie Emery is an England-born, Los Angeles-based journalist, editor, writer and digital media consultant. She specializes in sports, travel, active lifestyle, fitness and news. Gunnar Peterson has long been known as a Hollywood trainer to the stars. Last May, he added to his already-impressive resume by taking on the role of director of strength and endurance training for the Los Angeles Lakers. For a fitness professional with 28 years of experience who's also a lifelong sports nut (former clients have included Tom Brady, Randy Moss and Kevin Love), the NBA’s most celebrity-followed team was the perfect fit for Peterson. While he still maintains his own private gym in Beverly Hills — where he trains the likes of Kate Beckinsale, Kendall Jenner and Scott Foley — Peterson also travels to the UCLA Health Training Center in El Segundo, California to train the Lakers in the team’s high-tech headquarters. With one the youngest rosters in the NBA (the average age of players is just over 25) and four-time MVP LeBron James soon expected back from a groin injury, the future looks bright for the Lakers. We caught up with Peterson to find out how he’s fulfilling his goal to make them the strongest, best-conditioned team in the league. Strength-training sessions range from 15-35 minutes, and then the players practice, have a shoot-around, do 15-minutes of activation before the game, and finish with a 20-minute post-game lift. “That’s a full day’s work!” says Peterson. Read more: How Often Should You Strength Train to Lose Weight? 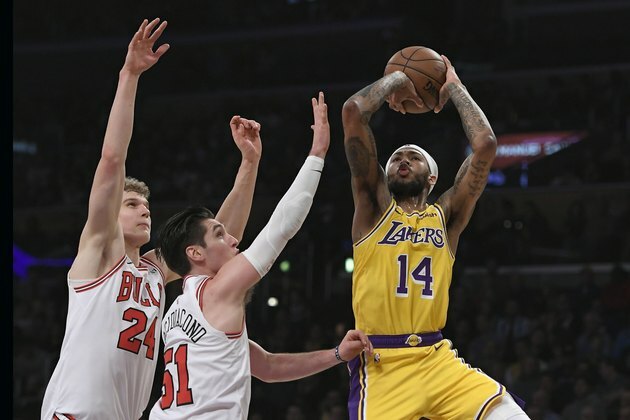 With 82 games in the regular NBA season (and more if the Lakers reach the playoffs), avoiding injury with dynamic activation exercises while firing up multiple muscles is a key part of their program. “We do activation work with bands on game days, hitting all three planes of movement — transverse, frontal and sagittal — plus a lot of rotational work,” Peterson says. “I’ll walk out to center court with about six different bands, such as the Mark Bell hip circle, as well as different-width bands from Sorinex, depending on the movements we are doing." These options could be a resisted lateral shuffle, overhead ab extension, a pull with a different hand position and a step back, a press with a step forward, or rotation and anti-rotation where he is “pulling against them and they’re having to work the core that way,” he adds. Just like LeBron James has made it very clear that he’s “more than an athlete,” players have to do way more than just play basketball to excel in the NBA these days. “People think they’re just playing ball all day — no way!" Peterson says. "They’re lifting before the game, they’re practicing, they’re competing, they’re lifting after, they’re doing treatment. Renowned for personalizing each training session for his private clients’ needs, Peterson uses that same philosophy with the Lakers. The focus in the weight room “depends on the player, depends on the day and depends on where we are in the season. What one guy is doing in September is not the same as what another guy is doing,” he explains. In the offseason, they alternate between a week of concentric movement [shortening], a week of isometric movement [static], and a week of eccentric movement [lengthening]. “We cycle it through, because you are going to get better gains that way. If you're doing that in all three planes of motion and against different forms of resistance, you become a stronger athlete,” says Peterson.